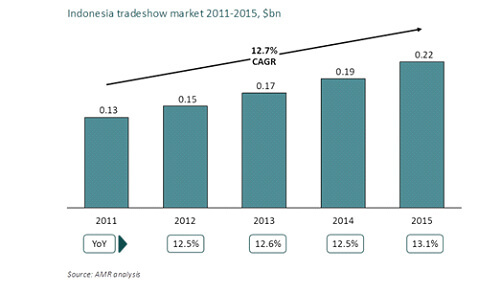 Despite the global exhibitions market experiencing a slowdown in 2015, the Indonesian tradeshow market continues to accelerate, offering lucrative opportunities for international organisers and investors, as reported in Globex 2016: the global exhibition organising market: assessment and forecast to 2020, produced annually by AMR International. Diana Gineva, Editor of Globex 2016 explains, “For the first time we dedicated an entire chapter on the Indonesian exhibitions market because it’s an underserved market that shows no signs of slowing. Since 2011 Indonesia has grown at close to 13% CAGR with further growth of c.16% CAGR forecast to 2020. This acceleration is largely driven by Indonesia’s growing middle class and infrastructure improvements, such as the expansion of exhibition venue space. Launching or cloning new events is a possibility for international organisers, as the market is far from saturation. Joint ventures with local organisers or events tend to be the preferred growth strategies, as they give access to local expertise and connections, while relying on the international organiser’s resources. The more profitable B2B exhibitions market remains underserved. Although organisers are increasingly shifting their focus to B2B industries, B2C events remain the largest segment. The global exhibitions market experienced a slowdown in 2015, expanding by only 1.7% compared to 4.2% in 2014 to reach $24.3bn. This was due to significant declines in Russia and Brazil, stagnation in Turkey and France, and a weak biennial year in Germany. China overtook Germany as the second largest market after the US, which is an indicator of the permanent shift in market power in favour of China. Ms Gineva said, “Overall emerging markets and the Gulf region continue to drive growth, together with a recovery in mature markets driven by overall improved macroeconomic conditions. Globex 2016 can be purchased online.